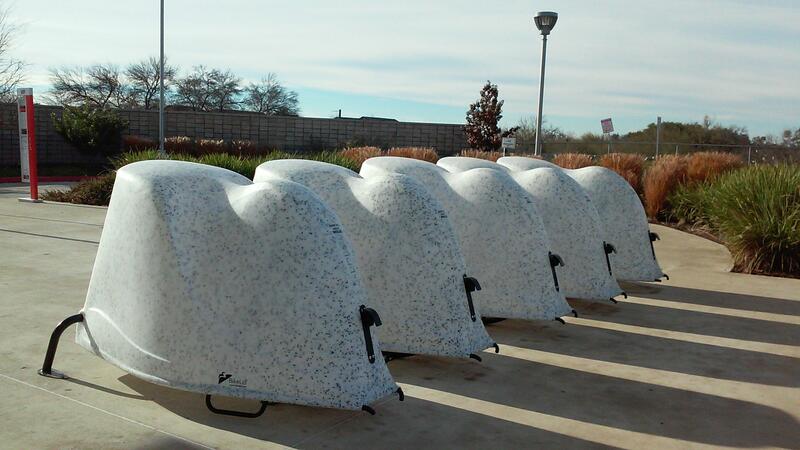 The VIA's new Bike Lids on display at San Antonio’s Medical Center Transit Station. Perhaps there’s no place at work to store a bicycle. Or perhaps the bus drops the rider off so close to their destination that the bike won’t be needed. Enter the Bike Lid, covered parking for your bike. You can’t miss the series of racks with the big plastic helmets on top. At the San Antonio Medical Center Transit Station, VIA’s Abigail Rodriguez last Saturday showed off the newest pilot program for commuters who ride their bikes to the bus stop but don’t want to take them to work. “They are first-come first-served, and they are free to use. You bring your own lock. They’re spring-loaded, and it’s recycled plastic. It looks like a shell, and it goes over your bike,” said Rodriguez. She added the pilot program started about six months ago with a set of 10 Bike Lids at the Medical Center. The next phase will add Bike Lids at the Ingram Transit Station. 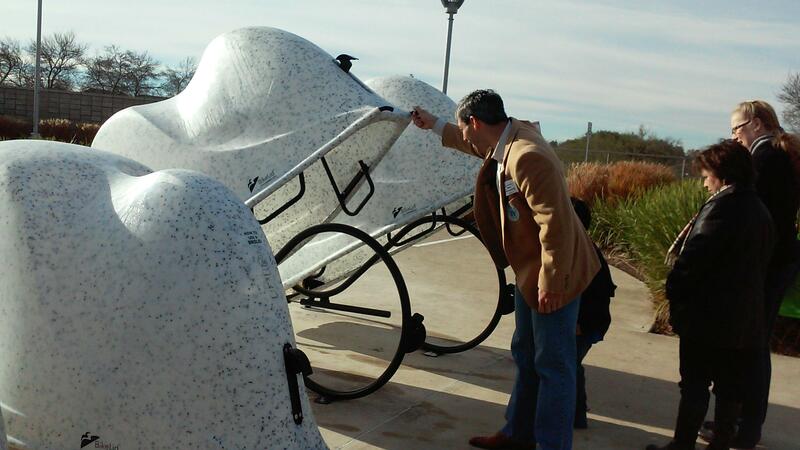 City Councilman Ron Nirenberg likes the idea of working out and then touring San Antonio. “You could ride your bike all the way around the city on the linear creekways, park it at one of these stations, and then take a bus wherever you want to go in the entire city," he said. The Bike Lid holds two bikes, and they’re open at the bottom but are mostly protected from the weather. VIA said they’re so secure that Homeland Security gave its stamp of approval. Neighborhoods across San Antonio are asking for bike lanes to be put onto their roads, but not one community on the South Side. After the city changed the traffic pattern of South Flores from Theo/Malone to SE Military Drive from four lanes, two each direction, to two lanes with bike lanes, many area residents were upset. The changes were made last year. The Source: Is San Antonio A Cyclist-Friendly City? This Friday, downtown dwellers are encouraged to walk or ride their bikes to work as part of the 18th annual Walk and Roll Rally, but is San Antonio a bicycle friendly town? Does San Antonio have the infrastructure, awareness and smarts to support a vibrant cycling community? And what does a city with that look like? This story is part of a project on commuting in America. Millions of commuters across the country have a new way to get around. 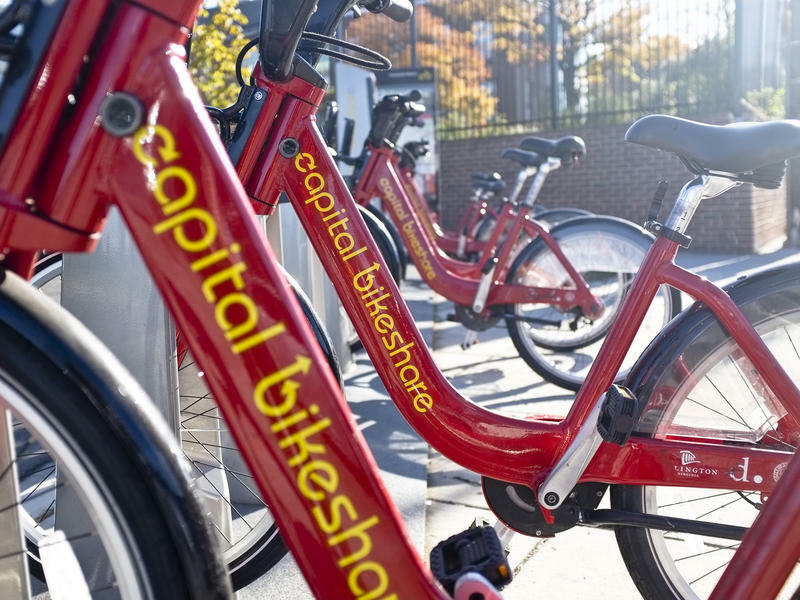 In the past few years, bike-sharing systems have popped up from Boston to Minnesota to Washington, D.C. They're supposed to make commuting easier, greener and cheaper. But the people who arguably need these bikes the most are often the least likely to access them.